3/25/13 Keshet- The date was October 13, 2010, and I was at Tufts University’s Coming Out Day Rally. At the rally, Tufts University’s Jewish Chaplain, Rabbi Jeffrey Summit, spoke about the importance of not just tolerating people’s differences but embracing them and told the crowd the statement quoted above. This message was so simple, yet so powerful — and so powerfully different from what I expected a religious leader speaking about LGBTQ issues to say. Growing up, I attended a Conservative Jewish Day School from kindergarten until 12th grade. Throughout high school, I struggled to come to terms with my sexual orientation and my religious beliefs. I was forced to grapple with these issues alone, as my high school did not offer any support for queer students and in general ignored their existence. As far as I know, no one has ever come out in my high school (though one student who was already out transferred in) and homophobiccomments, including the commonly repeated phrase “that’s so gay,” went unchallenged. Consequently, I never felt safe coming out in high school. I decided to come out at the beginning of my time at Tufts University and within my first few days atTufts Hillel, it was clear that my identity as a queer Jew would not be viewed as a contradiction but rather something to be embraced. The welcoming and accepting environment that I discovered at Hillel was the result of the amazing individuals who were involved, the welcoming staff, and the institutionalized inclusivity created by a permanent Hillel programming board position for Jewish Queer programming. Throughout my three years involved in the Tufts Hillel community, I have always felt that my Jewish and queer identities complement each other. I have been lucky and fortunate to be involved in a religious community at Tufts that embraces me for who I am and has a long history of embracing queer students. 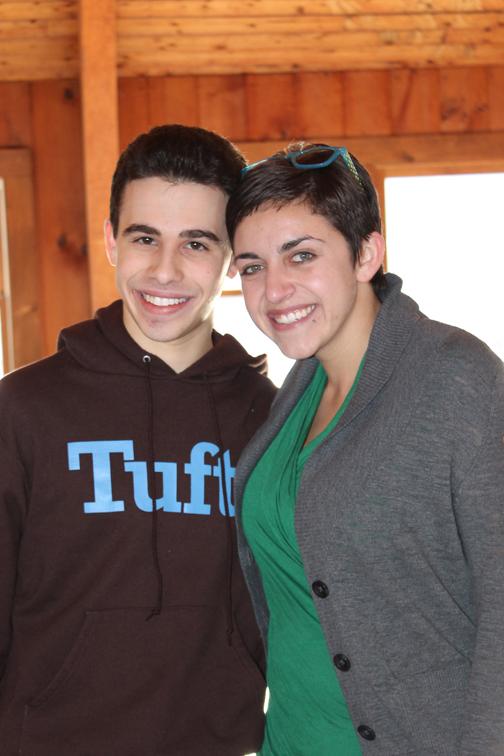 As a result, I have not had to work hard to create a more welcoming Jewish community at Tufts. However, recent events at Tufts University have emphasized that not all religious groups on campus provide such a welcoming environment. In response to a religious group being “derecognized” by the student government for discriminating against queer students (among others), Tufts Committee on Student Life created a new policy last semester by which student religious groups could apply for exemptions from Tufts nondiscrimination policy in their leadership criteria. A Student Religious Group could therefore choose, if granted this exemption, to bar queer students or female students or any other identity protected by the nondiscrimination policy from leadership positions. Since this policy was created, I have felt a need to speak out, as a Tufts student, as a Jewish student, and as a queer student. While I have no doubt in my mind that Tufts Hillel will not apply for an exemption from the nondiscrimination policy, I still feel I have a responsibility to work to overturn this policy. This responsibility in the end derives from my own Jewish values, which have taught me to speak up when I see injustice. As a member of the Coalition Against Religious Exclusion (CARE), the group on campus that is working to get this policy overturned, I have been inspired by the actions and passion of my fellow religious and nonreligious Tufts students. Ultimately creating a more inclusive environment in any institution, whether Jewish or secular, requires a strong group of like-minded and passionate individuals. While this policy represents a step back in the inclusive environment I have seen at Tufts over my three years here, I am confident that with the urging of CARE and its many supporters, the University will eventually overturn this policy. Until then, I will continue doing my Jewish obligation to make Tufts’ campus a more inclusive environment for students of all religious and social identities.